I want to build this x8 in rows for a drum machine im making for my daughter, where each row triggers individual drum samples from a seperate module. Does this "still" work, have there been any changes etc? Any help/advice is greatly apriciated! I am not aware of any changes, except for adding some fancy LEDs, and version 2.0 works. you want it to be ? because you could also leave out the external reset input and the x1/loop switch (loop is standard mode). signal for all or have individual clock signals but this depends a bit on how you built it, which brings me to the next point. the short/long switch. Just hardwire it for the short pulses and that should work fine. Yep no need for short/long. different tempo's for every circuit which can create some very nice patterns. This would be really nice, it doesnt have to be super-simple functionwise. This would also be nice, but ive only done a couple of compressor DIY kits before so, my skills limits me to schematics and instructions as for now. If you got the time, could you explain/draw it up for me? The "reset" position; does it make the sequence start over at the beginning? It would be nice with leds for each row which indicates where the sequence is at and - one row of leds which indicate which step is turned on. Is this easy to implement? I did a quick sketch of a hypothetical 3U front panel. If i loose the reset function, there could be a push-button with led as you suggest, which will free some space - but then again the reset function is nice. edit: nevermind the 7 rows - there should be 8 but no room for it as of now. yep. If you don't connect it (or actually connect it to GND as you shouldn't leave it unconnected) the 4017 will step through 0~9 and start with 0 again. If you would connect it to one of the outputs, for example Q7 it well only step through 0~6 and then start at 0 again. 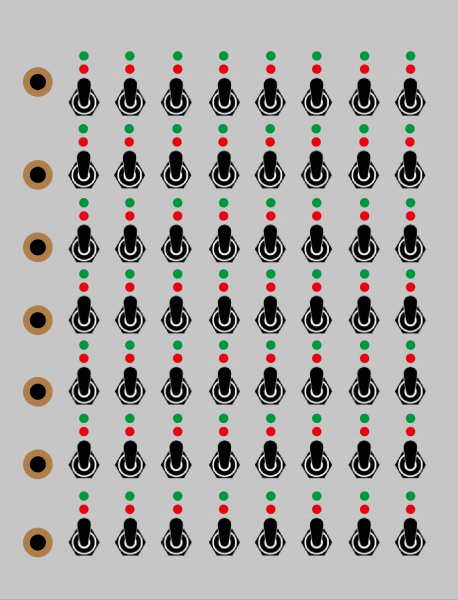 Pretty easy to do if you use double pole switches, then you can just use 1 half of the switches to turn the LEDs on/off. Ill get the parts and build a proto to get familiar with the circuit. Since im a beginner at this i have to ask where the power goes in? I see the 5+v symbol on the schematic - but wheres the negative? Edit: can i make it 8 steps, and just hardwire it to reset after the eight? It's a single supply circuit so in this case negative is the ground connection (what pin 8 of the 4017 and other components are connected to). can i make it 8 steps, and just hardwire it to reset after the eight? yes, just connect the reset to Q8 (pin 9) so it will cound from Q0~Q7. yep I used 1N4148 for those, but pretty much any diode should do (no zeners of course) so that's why I didn't label them. Actually the ones on the clk and reset inputs are NPN transistors, not really critical what you use. I used BC547, but 2N3904 or similar is fine too. What kind of powersupply would you recommend? Can i use a eurorack? connect any signals (like a clock source) to it that goes below 0V, or add a diode as protection. You drew little red circles around the emitter diodes of the transistor symbols on the left side as well. Mind that you should not insert diodes at these places in your circuit. The triangle is a part of the transistor symbol. Inserting diodes at these places would increase your LOW logic level output and the circuit might not work. I really like the use of on-off-on switches on each step! 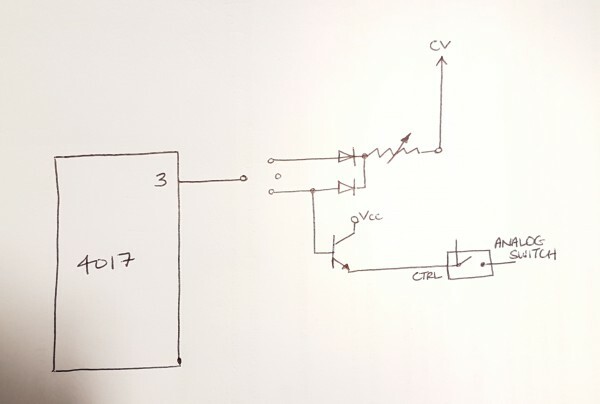 Would it be possible to have one of the ON sides connected to the base.of a transistor which acts as a switch to send high/low to a logic gate, as well as gating the CV? What I'm thinking is you could then have one ON triggering a long note (full clock cycle) and the other ON triggering a short note (half clock cycle). The OFF would mean no note. If the transistor was used correctly could it be used to drive logic without affecting the CV, as in - acting as a buffer? You could tie each of the 4017 outputs to a common transistor using diodes. Tried this out and works if i send into either a 4081 or 4093. Strangely though if it went into a 4069BE inverter then this affected the CV alot. hmm that seems rather odd, are sure it's a 4069BE and not a 4069UBE ? Could you draw exactly how you connected it ?